Starting from the most important issue of asset quality, Piraeus recorded a negative non-performing loan (NPL) formation for the second straight month, Eurobank’s figure turned negative for the first time, while NBG posted marginal NPL formation of just 2 million euros in Q2. 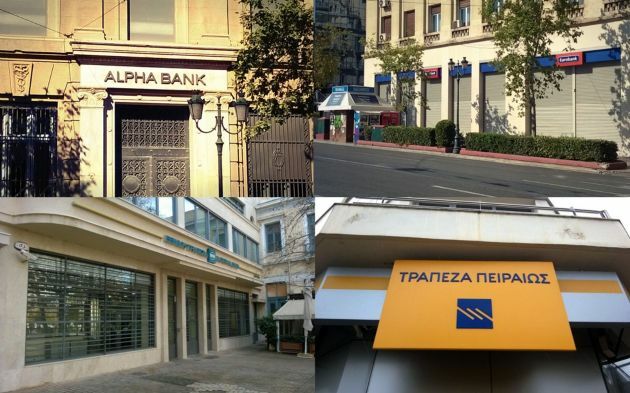 Overall, the four banks recorded a negative NPL formation of 93 million euros in Q2 for the first time in many years from a positive figure of 199 million in Q1 and 755 million in Q2 2015. On top of restructuring, the negative movement in NPLs also reflects increased write-offs. Bank of Greece (BoG) data showed that Greek banks’ write-offs climbed to 729 million euros in Q2 from 140 million in the previous quarter. The bulk of Q2 write-offs, around 600 million, involved corporate loans. As a result, the total stock of the four banks’ NPLs edged down to 83.9 billion euros at the end of June from 84.7 billion at the end of March, while the respective NPL ratio slipped to 35.1 percent in Q2 from 35.3 percent in the previous quarter also reflecting the ongoing loan deleveraging. Meanwhile, NPL cash coverage ratio slightly increased to 68.5 percent in Q2 from 68.3 percent in Q1. This largely resulted from a rise in impairment charges by 19.1 percent QoQ to 1.05 billion euros in Q2 from 878 million in Q1 and mostly reflects increased provisions of three banks for Marinopoulos case in Greece. It is worth noting that the provisions booked by the four banks in the first half (H1) of 2016 dropped substantially to 1.92 billion from 8.78 billion in the corresponding period last year, as banks had recorded at that time a huge number of impairment charges ahead of the results of comprehensive assessment conducted by the Single Supervisory Mechanism (SSM) published at the end of last October. The aggregate figures showed cumulative provisions in banks’ balance sheets eased to 57.44 billion euros in Q2, corresponding to 25 percent of gross loans, similar to the rate posted in Q1. At the same time, the stock of non-performing exposures (NPE) decreased for the first time to 115.54 billion in June from 116.2 billion in March, largely due to notable reduction in NBG’s Greek NPE stock by around 900 million, while the respective figure for Piraeus also fell by 100 million in the course of Q2. On the flipside the NPE stock of Alpha and Eurobank rose by less than 100 and 300 million euros respectively in Q2. Overall, the NPE ratio remained stable QoQ at 50.3 percent, while the cash coverage ratio was broadly unchanged at 49.7 percent. Speaking to the Parliament’s Economic Affairs Committee in mid-July, BoG governor Yannis Stournaras noted that Greek banks aim to reduce their NPEs by 40 percent by the end of 2019. In absolute figures, this corresponds to a cut by 41 billion on the end-March figure of 108.6 billion, which refers only to the bank’s operations in the Greek market. A similar message was recently conveyed by Eurobank CEO Fokion Karavias in the conference call for Q2 results. He revealed the bank’s preliminary targets, aiming for a 40-50 percent and 35-40 percent drop in the NPL and NPE stock respectively by the end of 2019. Stournaras indicated in July that the NPE reduction in the next years will largely result from the expected economic recovery and the consequent return to profitability for a large number of companies as well as from loan restructuring. On the core revenue front, net interest income (NII) of the four banks edged up by 0.8 percent QoQ, while the H1 figure rose by 1.8 percent from last year. The improvement mostly reflects lower wholesale funding cost, stemming from the reduced reliance on the Emergency Liquidity Assistance (ELA) funding coupled with lower holdings of pillar II bonds. The cash value of the latter more than halved to 4.9 billion euros recently from 10 billion three months ago. 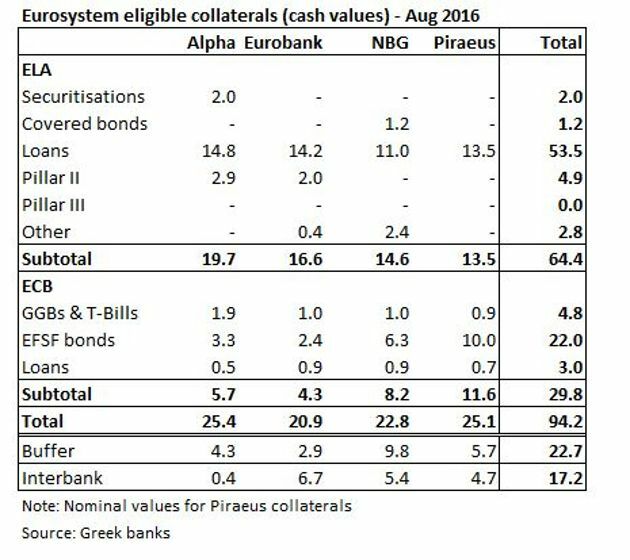 In specific, Piraeus and NBG have eliminated their exposure in pillar II bonds as of April and August respectively, while Alpha and Eurobank aim for zero reliance in the next 2-3 quarters. As an indication, Alpha said that the annual benefit (on NII and fee income) from the repayment of pillar II bonds would reach 48 million, the pillar II burden on Eurobank Q2 results stood at 22 million euros, while NBG estimates the annualised positive impact at 200 million. BoG figures displayed Greek banks’ reliance on Eurosystem funding dropped by 14.31 billion euros QoQ to 87.14 billion in June from 101.45 billion in March. A further decline by another 4.3 billion to 82.84 billion was recorded in July. The reduction in central bank funding by 18.61 billion in the last four months largely reflects ELA funding dropping by 14.75 billion to 51.45 billion in July, while ECB funding recorded a lower drop of 3.86 billion to 31.39 billion. As a result, the Eurosystem funding mix shifted towards ECB funding, which made up 38 percent of total in July from 35 percent in March. ELA funding’s share was reduced from 65 percent in March to 62 percent in July. The notable decline in the Eurosystem funding in the last few months reflects the completion of the first programme review, the reinstatement of the waiver on Greek government securities and participation of Greek banks’ EFSF holdings to ECB quantitative easing programme. In addition, banks differentiated their funding sources by increasing their interbank repos to 17.2 billion euros from 11.6 billion three months ago, mostly using EFSF bonds. On top of lower wholesale funding cost, some banks also recorded an improvement in the deposit cost. It is worth noting that the new time deposit rate in the Greek market is hovering between 0.85 to 0.88 percent in the past five months. However, during the conference calls of Q2 results, two banks guided for a 10-20 basis points reduction in the new time deposit rate by the end of the year. Such a development would further improve banks’ deposit NII. On the cost front, voluntary retirement schemes that have either been implemented or are due to be launched soon are expected to result in further staff cost containment for the four banks and support, along with core revenues, a rebound in the pre-provision income. Following the release of Q2 results, Greek banks remain adequately capitalized with their phased-in Common Equity Tier 1 (CET1) ratios remaining above the 16.5-perent mark, while the fully-loaded Basel III ratios were kept above the 16-percent mark for three of them. Tangible equity remained almost unchanged from the previous quarter and stood at 28.32 billion in total for the four banks. Taking into account that their market value currently stands just shy of the 7-billion mark, Greek bank shares are trading on average 0.25 times their tangible book value per share. It should be noted that deferred tax assets (DTA) of the four banks stands at 19.47 billion euros, making up almost 69 percent of their tangible equity. Alpha has the lowest share of DTA to tangible equity of around 52 percent with Eurobank’s figure of almost 90 percent standing at the high end. Overall, despite the rebound in the core PPI and the anticipated further recovery in the coming quarters as well as the positive developments on the NPL front, the single most important issue for Greek banks going forward remains the active and effective management of their huge NPL and NPE stock. The targets for reducing bad loans in the next years are expected to be finalised by the end of September, while the quarterly monitoring that will follow will prove whether the efforts are bearing fruit and signal not only a new era for the banking sector, but also positively contribute to the recovery of the domestic economy.